It’s been quiet on the Microsoft front when it comes to the official handset sales featuring its new Windows Phone 7 operating system but today the Redmond-based company has officially confirmed it has sold over 1.5 million handsets since launch. Achim Berg, Microsoft’s vice president of business and marketing for Windows Phones, details how the platform has gained momentum in the six weeks since it launched, commenting on how fast the Windows Phone 7 Marketplace has grown and how Microsoft intend on providing even more competition against Android and Apple devices. The figures are higher than many expected – it was reported that the company only sold 40,000 devices on launch day with Microsoft staying positive despite negative press around its sales. When compared to Apple, sales are somewhat short of the 1 million iPhone 3G units the company sold in its first weekend, but the smartphone market was only just emerging at that time. The drawback of entering the market late is that initial figures will be compared with those of your more established competitors. 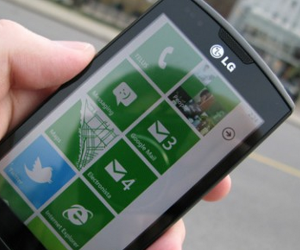 For example, the iPhone 4 sold 1.3 million units in just three days, sales that Microsoft could only dream about. Something lacking from the interview was just how many Microsoft devices are being activated by the company. In September, Apple announced it was activating 230,000 handsets a day, whereas Google recently released it was activating 300,000 handsets in the same period. By not including activations, Microsoft isn’t providing a clear picture of its performance, leading us to think that these figures are providing a smokescreen for the real performance of Windows Phone 7 handsets. Sales can be bumped up by operators, actvations show how many real customers you have. It is a steady start for Microsoft, the new year should bring about a more dedicated marketing and sales push by the company. Read next: Apple TV sales set to surpass 1 Million - Impressive?